BLOG TALK: ON BLOGGING ANXIETY. It's not news to me that I have anxious tendencies. Just like a bad habit, I fall into a pattern of thinking, worrying, and then over-thinking each and every possibility out there. I didn't think that it would really become a problem when it comes to blogging, however. But in a way, I shouldn't be surprised seeing as blogging really has become a part of my identity. But I digress. 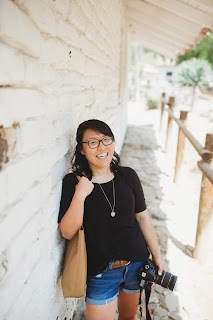 When it comes to blogging and anxiety, I recently discovered that I have a tendency to get anxious when it comes to staying updated with my online presence. If I have long or busy days, I'll get a little worried that I will get behind on blog-reading, Instagram-scrolling, and Pinterest-pinning. And if I don't have blog posts lined up for a week? I'll get a little worried, too. It's never been a bad anxious reaction, I just tend to think about it and will often worry. I don't get to the point where I have any panic attacks, but I also don't want to get to that point. So I've recently made myself take a break from blog-reading and blog-replying/commenting every now and then. I purposefully take a break from it all just so that I can breathe, catch up on sleep, and really just enjoy the time I do spend online. It was so hard for me to do at first, but with time, I've become more relaxed about it all. Sure, my inbox might get a little full (which can cause a little bit of anxiety, but that's a totally different story), but it's something that I need to do because I don't want my worries about being up-to-date to take precedence over my love and passion for blogging. The blog community is way too important to me for that to happen! 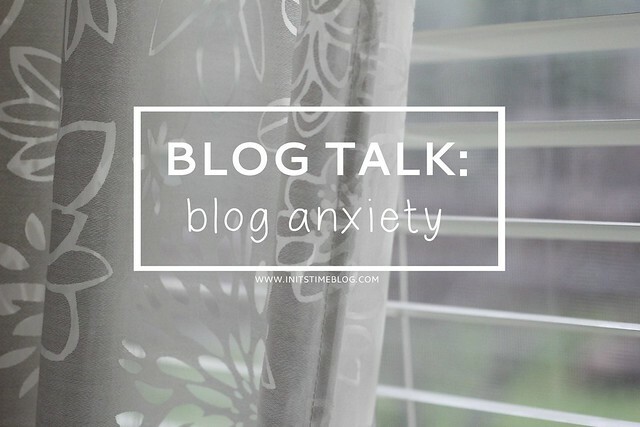 Have YOU ever experienced any anxieties when it comes to blogging? Have you tried internet-free breaks to help with it? I'd love to hear your thoughts/opinions and personal experiences! I had to cut back on the number of blogs that I follow and once a week, I clear my bloglovin reader so I can have a little piece of mind. Since I gave myself those rules, I found that I actually had more time for all my other hobbies. i get this way too! i definitely cut down on the number of blogs i read on a daily basis so i don't feel overwhelmed or constantly behind. a huge source of anxiety for me was facebook so i just stopped using it and then just deleted it. i don't really know what it was.... i guess people just expecting me to see every single thing they post & know about it the next time i saw them in person.... or people thinking they know everything going on in my life b/c they see a fraction of it on facebook... and making assumptions. i don't know... for some reason having a blog doesn't make me feel like that but facebook did so i cut it out and i honestly feel so much better after doing that! Why do we as bloggers feel this way? I don't think it is good and I bet just about every blogger has felt this at times. Limited internet in Myanmar has been a good lesson about letting it all go! I still struggle with it because I feel disconnected at times but I also have found that there are plenty of other non internet / blog things to do where I am at. This happens to me too! I hate it, it really stresses me out. A break really does help a lot and often re motivates me. I think the times in which I felt anxiety about blogging was when I was concerned with whether or not a post would be well received. Especially when I start to compare my blog to other amazing blogs, I can feel discouragement or anxiety because mine just isn't as good. However, when I let go of these things and take the time to enjoy what I'm blogging about and even in commenting on others' blogs, I feel that discouragement and anxiety go away. Oooh, I totally get what you mean about Facebook. I used to spend so much time just feeling obligated to like people's posts and share my photos and such. But since I've started blogging, I've actually stopped using Facebook. I still have my account and will scroll through it but I don't really like/post anything anymore. It's also helped that my friends are (for the most part) people I like and are friends with, if that makes sense! Thank YOU for understanding what I'm going through! It's always reassuring to know that the words I write are words that people can relate to. And I could definitely see how being somewhere with limited internet access could actually help with that. I think if anything, it's a reminder for me to just disconnect every now and then! Glad you can relate! And that you are taking breaks, too. They really are a great way to refresh and rest, too! Ooh, I never thought about that before! I definitely get little butterflies with some of my posts and I often judge the reception of my posts based on the number of comments, which I really and truly need to stop doing (but that's another post for another day!). I so have that same anxious reaction when I get back from a blog break or vacation. There's something about a full inbox that really gets me sweating and nervous! I think you're totally right. And when I think of it from the opposite side, it's not like I feel like MY comments/emails need to be responded to right away. I'm always happy just to hear back from the person, whenever it is. I didn't think about that, either! What a great point and now I know I'm going to feel better about not getting back to people right away! Thanks for sharing that! The thing that I want to do, but haven't been able to is to hit "mark all as read" on bloglovin once every week or so just to clear it out and give myself a fresh start. Do you do that when you take breaks from blog reading/commenting? I think that's a really good idea that I need to implement. Sometimes I feel like I have to go through my feed every day and then I get really stressed out by how many bloglovin emails are in my inbox (silly I know) so I think I may designate reading days- thanks for the idea! Having rules is the only way I can stay sane and keep blogging. Let me know if you ever try out the blog-free days and how they work for you! I know the feeling of blogger burnout! It's definitely a real thing and while I don't wish that that happened to you, I am glad to see that you're refreshed and re-energized! :) I love that feeling! I do a little of both! I really, really miss the reader thing that google used to have. I cannot remember what it was called right now! I have most of the blogs memorized, but there are a few whose addresses I just can't remember. And you're good for remembering your blogs! I can remember the ones I read daily, but I tend to just read them in order of bookmarks so it's become more of a routine just to do it that way! So true, so true. I think I put a lot of pressure on myself to make others happy, but really it isn't my job. It's something that I can do and should do, but it's not my job. Thank YOU for that wisdom! There is definitely truth in what you're saying! I agree in that anxiety is something that most all people experience at some point in their lives. For me, the most important thing is to make sure that I deal with it before it gets too out of hand.